Twister and Disaster have long closed to make way for the new attractions Race Through New York Starring Jimmy Fallon and Fast & Furious Supercharged at Universal Studios Florida. 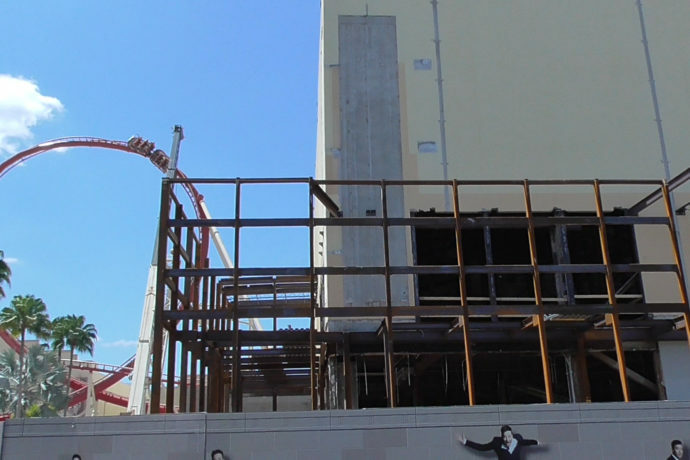 More New York facades are being added around the gutted soundstage building for the Jimmy Fallon ride. It’ll be nice to have that big bland building blocked by more themed New York building facades. Also, there is what looks to be a big rounded section of steel inside the building. It could be for a big screen, especially if this does turn out to be a Soarin’ type attraction as rumored. Lots of digging continues at the site of Fast and Furious, but not much else is happening there. And new picture spot props have been added to the Hello Kitty store. Check out the update video and lots of construction images below! Please don’t be another ride with 3D glasses. Please don’t be another ride with 3D glasses. Rounded steel supports inside the building… Could be for a huge screen, maybe? Set enhancements in progress… slowly. That’s all for this Universal Studios update! Subscribe to the feed for more continual theme park updates!